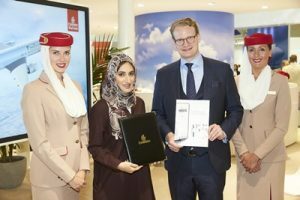 Emirates SkyCargo, the freight division of Emirates, has increased the range of solutions available to its pharma customers by entering into agreements for global container rental services with two leading players in the market: SkyCell and va-Q-tec, in addition to its existing cooperation with Envirotainer. The agreements allow Emirates SkyCargo to offer its customers a variety of specialised temperature controlled containers for the transportation of pharmaceutical or life sciences products. Emirates SkyCargo’s customers can have temperature sensitive pharma and life sciences products shipped using one of SkyCell’s temperature controlled containers. The Swiss made containers are designed to maintain products at +2°C to +8°C and +15°C to +25°C safely even under extreme outside temperatures such as –35°C to +65°C for several days. The patented containers use innovative material technology to recharge in Emirates SkyCargo’s cool chain network thus enabling “door to door” for a closed supply chain and have close to real time temperature monitoring capability. Pharma customers across Emirates SkyCargo’s global network of 155 destinations can now also choose to have their temperature sensitive shipments transported in va-Q-tainer’ containers – advanced passive containers providing temperature controlled solutions for six temperature ranges from -70°C to +25°C in extreme ambient conditions. ‘va-Q-tainer’ rental containers are available in 5 different sizes taking up to two US pallets inside and offer constant and deviation-free temperature control for several days without using external energy sources. Emirates SkyCargo’s agreements with SkyCell and va-Q-tec supplement its existing in-house pharma offerings which include the Emirates SkyPharma Cool Dolly which transports cargo from aircraft to storage areas in Dubai maintaining temperatures as low as -20°C and the ‘White Container’- a special container coated with insulators to counteract high external temperatures, giving customers a wide variety of transportation options for their pharma shipments. In 2016, Emirates SkyCargo launched Emirates SkyPharma- the air cargo carrier’s complete solution for transporting temperature sensitive pharmaceutical shipments. The carrier also inaugurated a brand new, state of the art facility at Dubai International Airport dedicated to the transport of pharmaceuticals. Emirates SkyCargo operates the world’s largest multi-airport hub certified for EU Good Distribution Practice Guidelines (GDP) for medicinal products for human use by Bureau Veritas Germany. This covers the carrier’s pharma transport operations at its Emirates SkyCentral terminals in Dubai World Central (DWC), Dubai International Airport (DXB) and the 24/7 bonded trucking service that connects the cargo between them. Emirates SkyCargo is the largest international cargo airline in the world operating a modern fleet of 259 aircraft including 15 freighters- 13 Boeing 777-Fs and two B747-400ERFs.